Mica Band Heater, Nozzle Heater. LEI™ Mica Band Heaters are sheathed with plated C.R.C.A. / Brass or Stainless Steel sheets. 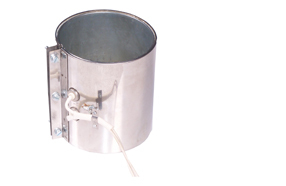 Heaters are provided with 1.5mm asbestos insulation and stainless steel cover. The heating Element (Windings) is of high quality Nickel-Chromium resistance wires. Heaters are available in One-piece and Two- peice designs. LEI™ band heaters with EXPANDABLE design feature allows the heater to be opened for installation over the barrel without causing internal damage to the windings. Heater Terminals are properly placed so as to avoid cold spots. 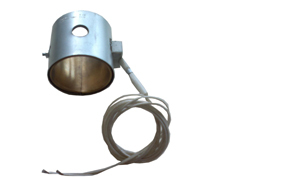 Heaters with various Terminal Options are also available: Flexible Wire/Pin Socket and screw terminals. Clamping action for the heaters are provided by either bent-up flanges (ears) or bolted Angle system. Blow Film Dies and Various Cylindrical applications. Wagle Estate, Thane. 400604, Maharashtra.INDIA. Tel. 91-22-25826767. Cell. No. +91-9773433927. Heaters Manufacturers India, Heaters Exporters, Mica Ceramic Band Heater, Ceramic Quartz Infrared heaters, Cartridge heaters, Energy Saving Heaters, Water Heaters, Air Heaters, Laundry Iron, Thermocouple, Nozzle Heater, Industrial Heating Elements Exports.